Until the series ended, Brian Michael Bendis’s Ultimate Spider-Man was a staple of my comics reading. When it launched in 2000 I was thirteen-years-old, and the perfect age to read about a teenage Peter Parker. As I got older, and my interest in the medium fluctuated, Ultimate Spider-Man remained an essential component of my reading life. Even when ‘ultimate’ Peter died, and was replaced by the Hispanic teenager Miles Morales died – by which time I was a full-fledged adult – I remained whole-heartedly invested in the world and its characters. During the 2015 mega-event “Secret Wars,” both the Ultimate Marvel universe and the mainstream Earth-616 universe were destroyed. When the dust finally cleared and the crisis concluded, Earth-616 was restored — along with Miles and his family. Thus, when Spider-Man: Miles Morales, Vol. 1 opens, Miles is one of two “Spider-Men” operating in New York City; and he’s a card-carrying member of the Avengers, too. My biggest fear was that this opening volume would focus on Miles’s transition from one universe to another; but that’s not the case at all. There is a real push to make this a fresh start and a true first chapter in Miles’s story. The only problem is, it cheapens the drama that’s come before, and brings into question the continuity of what we read in Miles’s adventures in the Ultimate universe. One of the most devastating moments Miles experienced was the death of his mother; now that’s reversed. There was real emotional when Miles’s father discovered his son was Spider-Man, and his anger and refusal to converse with his son was deeply affecting; now that’s been wiped away. Spider-Man: Miles Morales, Vol. 1 is a callback to the archetypal high-school superhero story. Basically: I have to save the world but I have homework, too. And while we’ve seen it time and time again, Bendis does it so well, and frankly, it’s nice to read a superhero comic working on a smaller-scale. Between you and me, I’ve a little over world-ending scenarios. 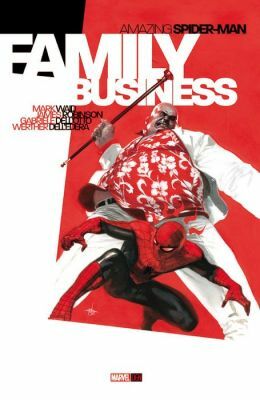 The best Bendis comics– Alias, Daredevil, Ultimate-Spider-Man — have always been character-focused, which suit his heavy-dialogue style, and it’s the quieter moments that prove the most memorable here. Miles’s confrontation with his grandmother over his flailing grades is hilarious; so too his conversation with best friend Ganke about whether it’s better to be “skinny and black” or “chubby and Asian” in America. Sure, there’s a whole plot-thread in Spider-Man: Miles Morales, Vol. 1 about Black Cat and Hammerhead teaming up to take out Spider-Man; but what makes the volume resonate is the building friction between Miles and Ganke over his secret identity. The super-heroics are just the backdrop for a fun, emotive high-school story. Sara Pichelli’s illustrations are gorgeous. The action is dynamic, but the way she nails the smaller moments – the mannerisms and expressions of characters during their conversations – is peerless. In issue #4 she draws ten pages of dialogue between Miles and Ganke in the school cafeteria. Boring, you might be thinking. But just check out the way she lays it all out. It’s incredible. Just like the whole book, really. No, Spider-Man: Miles Morales, Vol. 1 doesn’t redefine superhero comics. As a standalone tale, it’s not even particularly memorable. But as the next phase in the Miles Morales story – as another part of an unfinished collage – it’s fantastic.